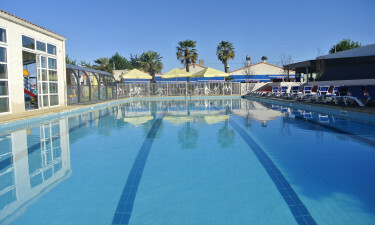 Le Trianon is an ideal family campsite situated in the beautiful Vendée region. With spectacular sandy beaches, river walks, dunes, pine woods and mudflats accessible for walks or bike rides, Le Trianon is an ideal base for exploring this attractive landscape. The luxury campsite is kitted out for comfort, and there are many cultural landmarks and Medieval buildings for history buffs to visit. Set in the beautiful seaside town of Olonne-sur-Mer, this is a luxury camping experience for sun loving families. With pitches enclosed by woods, Le Trianon's mobile home accommodation offers seclusion moments from funt. There are numerous classes to participate in on site, and there are also action-packed choices in the local area. For an unforgettable camping holiday, choose Le Trianon with LuxCamp. Why choose Camping Le Trianon? 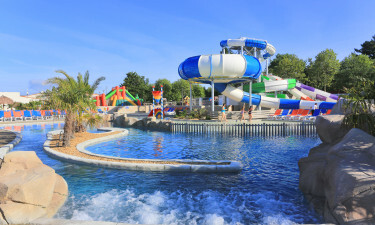 Le Trianon offers a sizeable water park in the luxury camping site. There is a paddling pool for the little ones, heated swimming for serious workouts and six water slides. For those looking to unwind, therapy benches and a jacuzzi are available within sight of the main pool. If you'd prefer to soak up the water and sun on the Atlantic coast, you are a 600m walk from Olonne-sur-Mer's sandy beaches, or a 5km drive from the famous seaside town of Les Sables-d’Olonne. There you can indulge in fresh seafood and enjoy the sand dunes at your own pace.